Over the past couple of nights, I made 15 of them using the Think It, Make It Pouch Tutorial as gifts for colleagues and friends. The most difficult part was finding just the right buttons to match the different fabric linings and then hand sewing them to the pouch, which is to say not difficult at all. 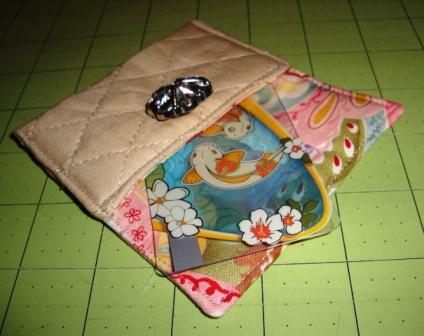 The finished size is just right to hold a credit card or two or it can be used as an envelope for a gift card. Or even as a tooth envelope for the tooth fairy. The possibilities are endless.